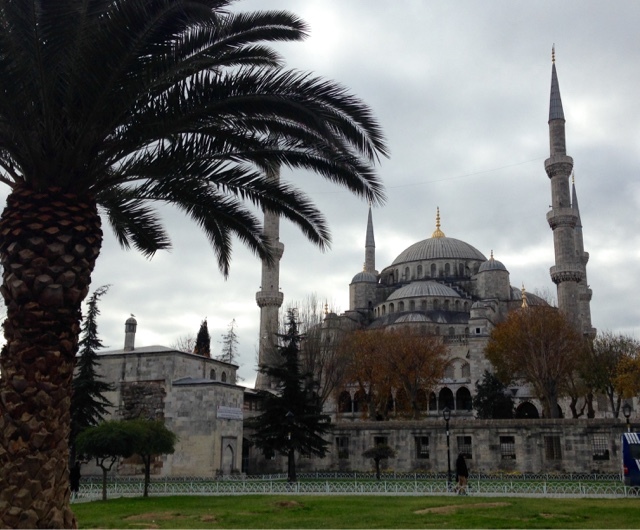 I arrived in Turkey exhasted after a 17 hour layover in Saudi Arabia. 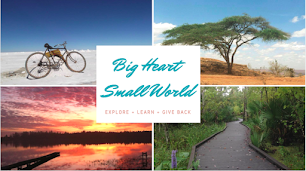 Other than my first night at World House Hostel, I had nothing else planned. I took th metro from the airport to the hostel. The metro is very easy, maps are placed through out the stations and trains. Stations are announced in Turkish and English. Everyone I asked for help were very enthusiastic to help, even if they didn't speak English. Immediately as always I met a new friend at the hostel. He was from Turkey and was visiting a friend in Istanbul. He invited me to join and how can I say no? Within a couple minutes of arriving to the hostel I was heading out again. Istanbul is the largest city in Turkey with over million residents. It's divided into many different districs, which each have their own atmosphere. World House Hostel is located near Galata Tower in Taskim. Taskim is very busy and boast some of the best nightlife in Istanbul. The Main Street in Taskim is packed with people in the evenings. Small windy streets fork from the main road. These streets are packed with restaurants, bars and cafes. 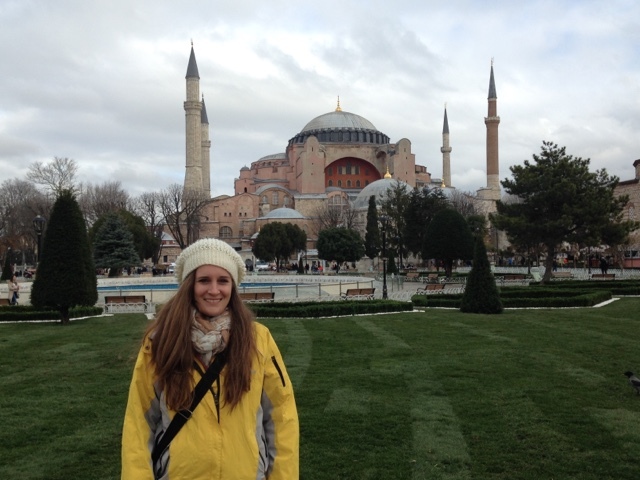 My new friend and I headed out for a beer, then a Turkish coffee followed by dinner with a view of Galata Tower. Friday and Saturday are the most popular nights to go out in Istanbul, but there is always a party happening in Taskim. After dinner we happened upon a small bar with a live Turkish rock cover band. The next morning we headed out to try some of the famous foods of Turkey. 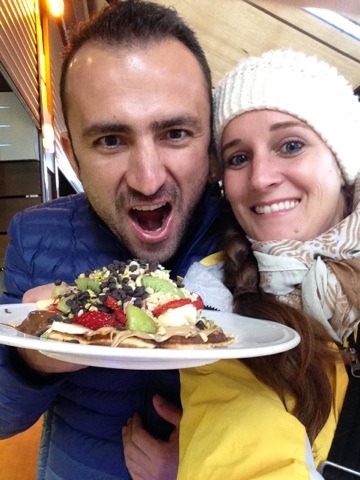 We traveled to Ortakoy for waffles and kumpir. We sat at a small restaurant near the water under the bridge and enjoyed kumpir, which is a large baked potato packed with various items, including cheese, salad, veggies, sausage, and toppings. After a filling kumpir we found some space for a Turkish waffle. This is no ordinary waffle, this a is a waffle topped with chocolate, white chocolate, Carmel, bananas, kiwi, strawberry, and nuts. 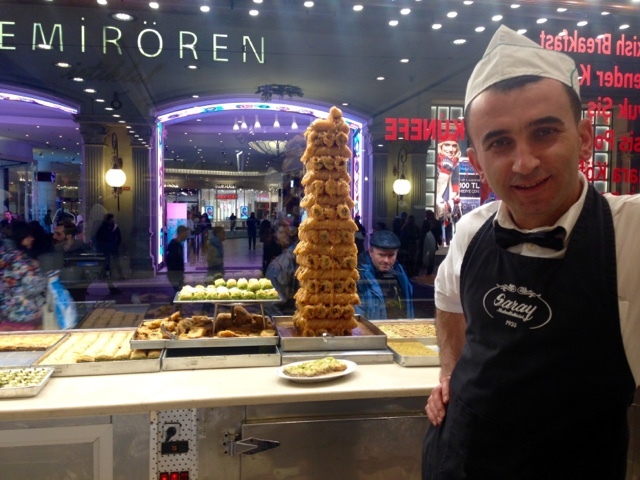 Both kumpir and waffles are a must try in Istanbul. After lunch I visited a Turksih Bath or hamam. Here I undressed to my bathing suite bottoms, entered an extremely hot room, poured water over myself, entered the hottest sauna of my life for about 30 seconds until I gave up and then rested on a heated rock. I waited until a large naked Turkish lady entered the room and beckoned me to a smaller room to clean me. She proceeded to bark orders in Turkish, which I struggled to understand. She scrubbed me with a scratchy cloth all over, removing way more dead skin than I thought I even had. Then she poured bowels of water over me removing the skin. Next she had me lay down on a stone slab and she covered me with bubbles. I felt a bit like a child in a bubble bath. She rubbed me all over shouting at me in Turksih when she wanted me to change positions. Again she threw water over me, removing the bubbles, she finished by washing my hair and then sent me back to the large hot room. 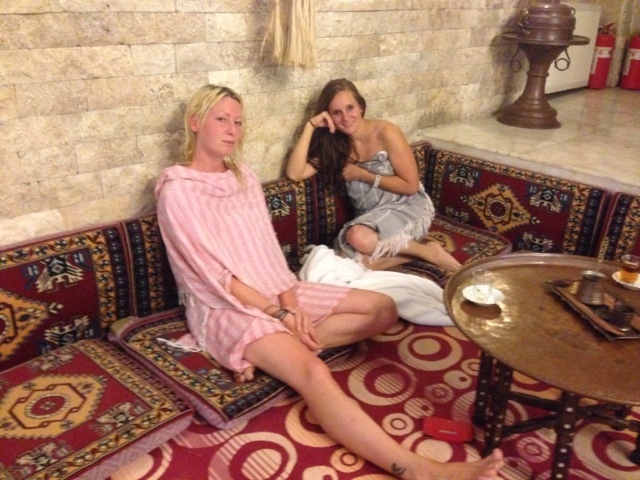 I finished the Turkish bath experience with an apple tea. The whole experience costs 60 Turkish Lira ($20 USD) at Aga Hamam on Taskim. After the bath I met another friend and we three headed out for dinner and drinks. Our Turkish friend lead us down a windy street, into a noisy bar, up a flight of stairs, into a small elevator and out onto a rooftop patio for dinner. We tried a dish of fried Hamsi (anchovies) and Doganay (fermented turnip juice). The Hamsi were very good but I was not a fan of the fermented turnip juice. We then proceeded to dessert in one of the small Turkish bakeries along Istiklal street. We tried ekmek kadayifi, a Turkish bread pudding bathed in sugary syrup served with a dollop of thick cream and we tried kabak tatlisi, butternut squash covered with syrup and pistachio pieces. After dessert we headed to a small club to dance to Turkish and Arabic music. The next morning exhasted we walked down to old city to stroll through the famous historical sites, including Hagia Sophia and the Sultan Ahmed Mosque (blue mosque). Near the spice market we had Balik ekmek (fish sandwiches) served straight from boats lining the Golden Horn near the Galata Bridge. After dessert we enjoyed Lokma (fried balls covered in syrup) from small carts near the bridge. 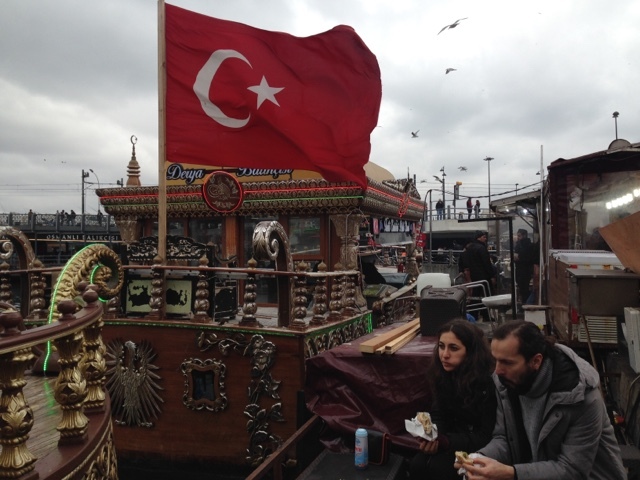 We three boarded a boat and headed over what they call the Asian side of Istanbul. On this side it's a totally different feel. The touristy hustle and bustle of the European side was replaced with a more local and calm atmosphere. We walked through narrow windy streets admiring unique coffee shops on every cornered. We walked back along the water stopping for Turkish coffee and apple tea at Kemal'in Yeri a small cafe perched on the cliff overhanging the Sea of Marmara. For dinner we strolled the windy streets to meet up with some friends at Ciya Resturant. 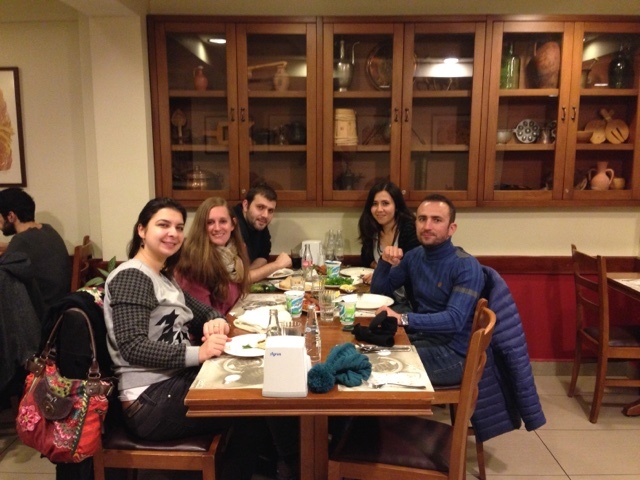 Here we had a plethora of Turkish cuisine. We enjoyed a plate of mixed appetizers including domas (stuffed mwine leaves), hummus, cacick (yogurt and cucumber) and many more. For dinner we started off with a lahmancun, which is ground meat, onions and spices on a thin circular bread. You top it with cilantro, tomatoes and onions, roll it into a burrito like shape and eat it. At this point I was full but the main meal was yet to come. Lamb kebabs were delivered to our table with salad, bread and rice. We washed this down with Ayran (thin yogurt drink). For dessert we shared a large thin square pastry stuffed with pistachio paste. I took the ferry back to Taskim just in time to board my bus to Goreme, Cappadocia. 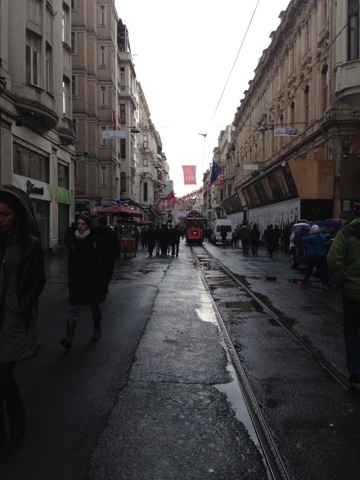 Overall I loved Istanbul, it was very westernized yet had many reminders of its past. The city is very young and fashionable with many restaurants and bars catering to the large young population. The food is amazing and diverse. Turkey is fairly cheap, hostels range from $8-15 a night and a meal can cost between 3-30TL ($1-10). My favorite part were the countless coffee shops which offered wifi and amazing coffee and treats. I can definitely see myself living in Istanbul someday. My adventures in Turkey will continue. Stay tuned to hear about Cappadocia and Pamukkale. Thanks for sharing, Istanbul is an amazing city. Want to share with you one tip how to travel fast and save your money, it's using Kiwitaxi online taxi service http://kiwitaxi.com/Turkey/Istanbul this is the best decision if you're travel with your family and want to be in some place just in time.